Have you searched through Video slots in the uk countless spec plans without finding one that meets your needs or fits your site? Have you priced architectural design services to find that, Coral casino although they can craft the house of your dreams, their fees are far beyond your budget? We offer a unique alternative! At Milwaukee Craftsman LLC we believe the user should play an active role in the design of the home. Aesthetics and function are more important than large expansive spaces, and that the character of a home should please the user rather than impress neighbors. We offer a creative option to today's typical suburban homes. Our homes combine the detailing and character of the Arts & Crafts Movement along with layouts that meet the needs of contemporary lifestyles. We focus on designing homes with charm and efficiency. Our unique design process provides you with a complete custom designed home at a reasonable cost. These services are structured with small to moderate size homes in mind. We will design a home specifically for you, anywhere in the United States. Construction plans are fully detailed construction documents or blue prints. They include all dimensions and specifications needed to bid and build your home. They may require additional foundation information and beam sizes due to the varying site conditions throughout the country. They typically include floor plans, framing plans, roof plans, exterior elevations, interior elevations, building sections wall sections and specifications. Design plans are conceptual drawings, including floor plans, a roof plan, 4 elevations, and a schematic section, which can be used for planning purposes. 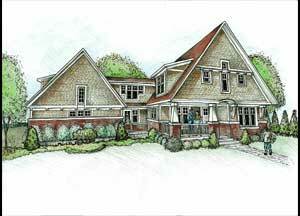 They show the overall design of the home, but do not include enough information to build from. They include written authorization allowing you, your architect, or your designer to complete or even modify the design as it meets your needs. Design plans are available in drawing form and in CAD files. Construction drawings of some of our designs are available through www.HealthyHomePlans.com under architects.